There’s something fun about building snazzy graphs and charts in which the data points are arbitrary and ultimately decided upon by myself. This is why I’ve been having a blast building a few lab graphs using the recently released Grafana 2.0, which is “an open source, feature rich metrics dashboard and graph editor.” It’s certainly much simpler than others I’ve stood up, such as the really slick sysadminboard that I have a lot of respect for. And it includes multiple methods in which you can share your dashboards, such as local snapshots and published snapshots on raintank.io. “@ChrisWahl: Kicked the @grafana tires with some simple data feeds from the lab pic.twitter.com/dhtehcMtd3” < hoping this turns into a blogpost! Because Shane asked for it, I’ve written down much of what I’ve been doing with Grafana in this post and tried to explain how I stood up various graphs. If I glossed over something significant, drop a comment and let me know. So, I went with InfluxDB. Up to you, really. These deploys are elegantly simple. I default to CentOS 6.6 in the lab, so you can follow the official install guides if you’re in the same boat. You could also drop Grafana on Windows or Docker. There’s also modules for Chef, Puppet, Salt, Ansible, and others. Note that my template image includes the Extra Packages for Enterprise Linux (EPEL) repo because it crops up as a requirement so often. I don’t recall if that is required for these packages, but just throwing that out there. I suppose you could deploy both packages to the same server, but I ended up cloning a pair of servers in the lab and deploying each package separately. 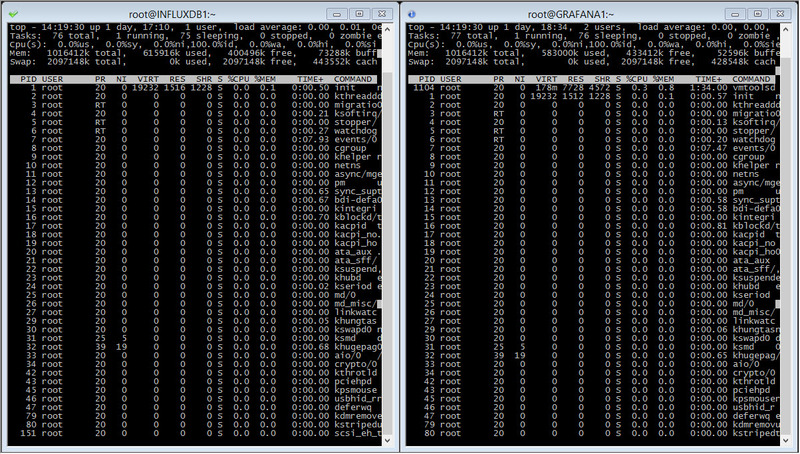 Both the Grafana VM and InfluxDB VM have 1 vCPU, 1 GB of RAM, and 20 GB of thinly provisioned disk space. For a lab environment, this seemed to be more than adequate. Assuming you’ve stood up the servers per the instructions, you’re almost done. Browse to the IP or DNS name of the InfluxDB server using port 8083 and a login of root/root. Head to Databases and create a database with whatever name strikes your fancy. I went with spongebob because that’s how I roll. The details and shard space information can be left at defaults. If you use the Explore Data link, there’s currently nothing in the database to explore. You could manually enter some data just for fun – in fact, I suggest tinkering a bit to understand how to use the SQL-like query language and read up on the required format for the JSON payload. The query format is quite simple and likely something you won’t be using much in this walkthrough – we’re going to mainly focus on Grafana as a front end. However, knowing how to construct the payload is important. Notice that no work was done prior to set up the tables and columns; the very act of posting to the API will add data points to the series name specified. Also notice that the points key:value pair uses a nested array because you can batch data points and send over multiple arrays at one time (using your own timestamp value). If you want to rely on the InfluxDB timestamp, send over one array at a time and the point in which the server receives the data will be used. That’s pretty much it for InfluxDB. You now have the back-end stood up and ready to receive data. I’ve written a series of PowerShell scripts to collect data from vSphere Hosts, VMs, SQL Server, and a NAS share used for Veeam Backups. You can view those in my grafana-vsphere-lab project to get started with data collection, use the ps1 scripts as examples, or even improve upon the repo and send me a pull request. I don’t think the project will become anything super polished, but I wanted to share what I’ve written thus far. The Grafana web interface is available by browsing the IP or DNS name of your Grafana server using port 3000. The default login is admin/admin. There are no dashboards out-of-the-box, so the first screen you see will be rather barren. Enter the information for your InfluxDB server, including the database name (mine is spongebob). Don’t forget that the API URL is 8086; don’t use port 8083 (web interface). 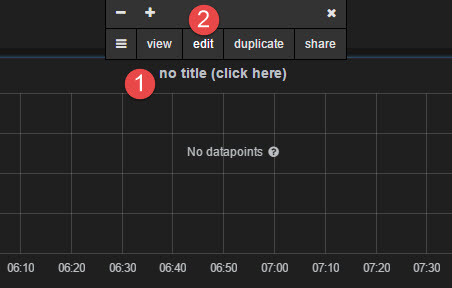 I’d recommend making this data source default, as otherwise Grafana defaults to itself as the data source. It’s time to build a dashboard! Choose Import to load a dashboard from a JSON file. You can load my sample dashboard using my JSON example on GitHub. Once you have a dashboard created, it’s time to make some graphs. Select the green menu button on the left side to edit a Row. If you want more rows, use the purple Add Row button. To save your work, press the Save button. Click on the Title (that says no title). There’s a lot you can do here, so I’ll focus on a single use case to get your noodle juice flowing. Graphs use data sources to create visuals. Because my InfluxDB was added, and is being updated with live data from my various scripts, it’s really just a matter of finding the data and displaying it with Grafana. Each series you enter in Grafana will pull one or more series of data from InfluxDB (or other back-end data sources) and use select statements, time grouping, and other query delineations to dynamically build a graph. Because I use a set naming structure for my hosts (the $vmhost var), it seemed easiest to use a regular expression (regex) for the two metric series necessary to pull data as opposed to creating a query for each host individually. The nice thing about a regex is that it will automatically add new hosts to the chart without any help, so long as I continue to use the same name format. Enclosing a string with forward slashes is used to build a regex with an InfluxDB back-end data source. The bracketed [0-9] portion allows the metric to pull data from any match that includes a single number in the name, such as esx1 and esx3. The hosts with a “d” in them are marked for dev work. And so on for series names with more periods. Make sure to save the dashboard when changes are made, or just browse away from the dashboard and discard changes if you don’t like how it looks and want to revert to the last save. With a little time and work, you can have some pretty amazing graphs built into the dashboard. Hello, this may be a dumb question, but looking at the .ps1 scripts I cannot get how do you manage how frequent you send data to the InfluxDB. How do you handle that?. Task scheduler? Exactly right – I have a utility server that runs the Engine as a scheduled task every minute. Hey Chris, what do you think about using Grafana for network monitoring? Mainly for Resource Utilization and perhaps flow data. Seems like a solid use case. As long as you can leverage an API or other programmatic method to ingest the data, the graphs would be pretty slick. This is a bit old but wondering if you could help. I know all of my credentials work, the datasource says that it’s working within Grafana… Any ideas? JSON is deprecated in the newer versions, although you can still enable it for the time being. That said, I’ve enabled JSON in V0.11 and it still won’t work. “Json: cannot unmarshal array into Go value of type struct”. That’s a bummer. I don’t really plan to revive work on this project as I am focused on Vester and Rubrik modules. If you end up fixing the code and want to send over a PR, I’d be happy to merge it in.